Among the many things to do in Northern Sardinia, there is one that unites all those who love the sea, nature and discovering things: the island of Caprera. 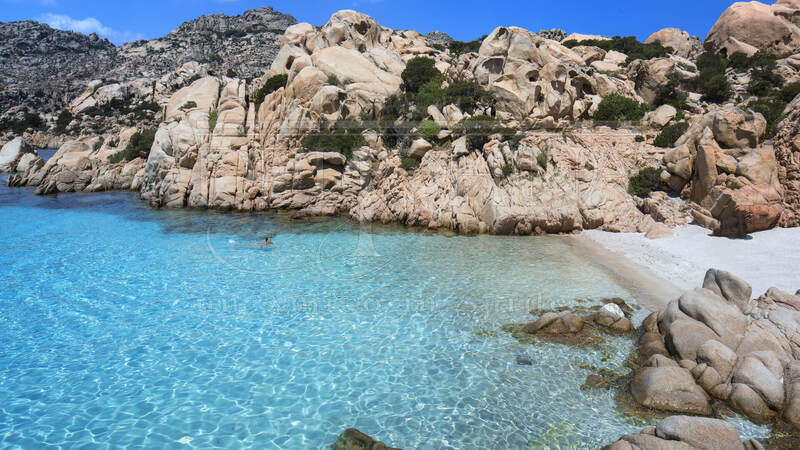 So if you are spending your holidays in the hotels at Palau, Cannigione and Santa Teresa Gallura take advantage of the short distance to the La Maddalena Archipelago and go and visit the second largest island there. Practically deserted, here the Mediterranean macchia or scrub proliferates in an infinite variety of bushes, flowers and local plants all inhabited by species of protected birds but also by goats and sheep living completely in the wild. The ever-changing blue of the sea and the white of the beaches mix with the green of the flora in a perfect union. The Relitto and Due Mari beaches are among the most famous but there is also Cala Coticcio, the small cove that has been photographed from every angle and which has earned the nickname of little Tahiti for the extraordinarily transparent water. Diving enthusiasts are in seventh heaven thanks to the incredible diving sites with features such as the underwater landslides of Fiordino, Cala Inglesi and Shark Point. These locations are rich in marine fauna such as groupers, snappers, meagre fish and morays that liven up submarine landscapes of rare beauty, but you can enjoy a splendid dive even with just a simple mask and snorkel. After diving in crystal clear waters and walking among the granite and the paths with their scent of helichrysum, don’t forget to satisfy your thirst for discovery by going to see the reason why the island of Caprera is so famous: Garibaldi, the hero of the two worlds. When Giuseppe Garibaldi arrived on the Archipelago it was immediately love at first sight. He decided to buy half of the island and after living for a period in a small house, he built the famous Casa Bianca, the home in which he chose to spend the rest of his life together with Anita and their children. Garibaldi’s tomb is still just behind the house, along with those of his children. The Casa Bianca has become a museum with articles, furnishings and original tools while a few miles away the National Garibaldi Memorial Museum takes the visitor on a multimedia journey that narrates his life and deeds and where it is possible to consult among other documents, the complete manuscript of the Garibaldi Memories as preserved in the Central Archives of the State of Rome. But Caprera has as many museums as it has beaches! Two other sites intrigue visitors who pass through these parts: one is the Natural Geo-mineral Museum where samples of rocks, minerals, fossils, shells, sand from beaches and flora and fauna from the islands of the National Park of the La Maddalena Archipelago are kept – a highly valuable treasure trove if you think about it! Instead the Museum of the Sea, opened in 2006, displays objects and documents related to the ancient local culture which is inextricably linked to the sea. And finally, before you finish your tour of the Island of Caprera, do not miss a visit to the Delfini Research Centre, established in 2000 for the monitoring, study and research into cetaceans. In fact, the mirror-like sea of the Archipelago, which is part of the “Pelagos” Sanctuary for Marine Mammals is full of dolphins and cetaceans that you might well encounter during an excursion to the islands on board our boats.